We have been waiting for permits for weeks. It stinks! Apparently this is normal in the county in which we live, but it still stinks. You’d think since it is so hot here in the summer that it would be a slower time for builders, making it easier to get permits, but that is not true. Many of the luxury high-rise condo’s here have restrictions that state no renovations during ‘season’. Season here is approximately November thru April/May. That is when all the ‘snowbirds’ from up North fly south for the winter. This means more contractors submitting things for permitting to the county in the summer, just like us. There is also tons of new construction here all the time making it hard to get permits year round. One last thing is that the county where we live is HUGE, at least it is way larger than counties in Massachusetts where we grew up. Our county is roughly the size of Rhode Island or maybe even larger which makes it approximately 1/3 the size of the entire state of Massachusetts. Anyway, our contractor submitted our architectural plans about 4 weeks ago and here we are still waiting. Our plans were sent back once to the architect, which apparently happens all the time, and the permit office is also waiting for a few more documents before they will give us the go-ahead. It is a very frustrating process! Hopefully we will get them soon! We’ll keep you posted. Does anyone have any horror stories, or better yet, good stories to share regarding permitting? 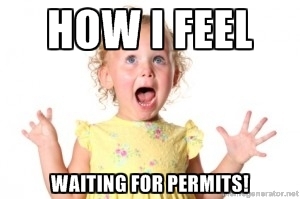 Vacation time over and permits approved!